The quality and availability of fresh water are of critical importance to human and ecosystem health. Given its central role in the functioning of all living systems, water is arguably the most important of all natural resources. It also includes brief reports on issues such as arsenic in ground water in Bangladesh, the collection of fog as a source of water in remote regions, the role of nongovernmental organizations in meeting basic water needs, and an update on water and the internet. Following the overview chapters are more than thirty charts and tables that offer data on topics including: water use by country, agricultural water use, salinization, endangered aquatic species, major rivers in China, dam capacity, desalination capacity, and more. 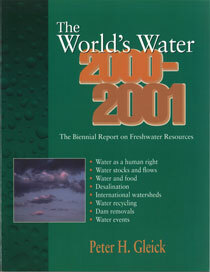 The World's Water is the most comprehensive and up-to-date source of information and analysis on freshwater resources and the political, economic, scientific, and technological issues associated with them. It is an essential reference for water resource professionals in government agencies and nongovernmental organizations, researchers, students, and anyone concerned with water and its use. -Is There a Human Right to Water? Chapter 4. Water for Food: How Much Will Be Needed? -How Much Water Will Be Needed to Grow Food?